Soul Serenade: Billy Stewart, "I Do Love You"
Billy Stewart brought a unique vocal style to ’60s soul and created some of the most memorable records of the decade. Fat Boy. That can’t have been an easy moniker for Billy Stewart to accept. Oh sure, he probably smiled when people called him that, and he even recorded a song called “Fat Boy,” but it still had to hurt somewhere deep inside each time he heard himself referred to that way. Stewart was probably best known for the stuttering vocal style that characterized his Top Ten version of George Gershwin’s “Summertime” in 1966. It was a unique record, and a great one, but for me, Stewart was always at his best with the ballads. Early on Stewart sang gospel with his brothers in Washington, DC. He crossed over to the secular world by filling in with a group called the Rainbows, which was led by Don Covay. Legend has it that it was none other than Bo Diddley who discovered Stewart playing in DC in 1956. Stewart’s association with Diddley led him to a record deal with Chess Records, and Diddley played guitar on Stewart’s 1956 record, “Billy’s Blues.” The record was a moderate hit, especially in Los Angeles. Stewart then moved on to Okeh Records for a few years. By the early ’60s, Stewart was back with Chess. 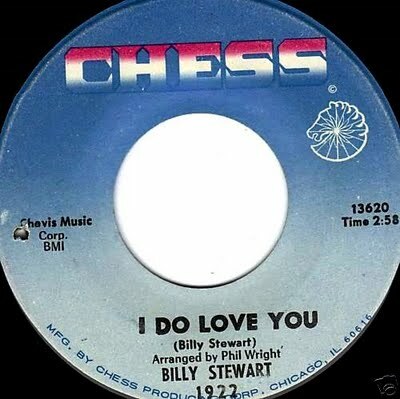 Working with A&R man Billy Davis, he recorded “Fat Boy” there, and hit chart hits with “Reap What You Sow,” and “Strange Feeling.” Real success finally arrived in 1965 with the release of “I Do Love You” a song written by Stewart. The record reached #6 on the R&B chart, and #26 on the Pop chart. Stewart also wrote the follow up, “Sitting In the Park,” which was even more successful. Stewart kept recording, without much success, for the rest of the decade. His weight ballooned, and he developed diabetes. There was a motorcycle accident in 1969. Stewart suffered only minor injuries, but in January, 1970 he was killed in a car accident when the new Thunderbird he was driving plunged into the Neuse River in Chicago. Three passengers in the car were also killed in the accident. Billy Stewart never made it to his 33rd birthday, but his brilliant voice and the records he left behind will live on forever.